World building, and all that it implies. From Middle Earth to Narnia to Tatooine and beyond, there are endless conditions, from ecological to political, that have to be considered and accounted for, and this is the grand foundation of storytelling, and the cornerstone of our profession. Tales of Amalthea, the project that I’ve been working on for nearly 2 years, has just been released online in its preview format. In a nutshell, it is an ongoing program in Creature Design that combines art, science, and epic story in a linear, episodic form—one lesson builds upon the next, and all the many varied characters, based on real and prehistoric animals, relate to each other in their contextual roles. Amalthea is a Pleistocene, Earthlike planet peopled entirely by intelligent creatures, and all these species have their own unique cultures and behaviors. Some live in complex societies, and create weapons and art, while others live without any amenities whatsoever. It is a very dangerous world, of predator and prey, and nature red in tooth and claw, where the desperation to survive is the daily occupation. Very similar indeed to life on the African Veldt. In creating the iconic species that inhabit the grassland continent of Ungallah, I had several factors to consider. These need to include the Hero species, and those related to him. How do these animals survive in their environment? Since they need to create objects, how do they create them? How do they interact with their world, each other, and other species, such as predators? Plus, they need to be strong, swift warriors, and not be anything that has been done before. Thus, I looked to Africa, and to the ungulates. In past fantasy and sci-fi stories, TV programs, and motion pictures, we’ve seen plenty of bug-eyed, ape-like, chimp-like, lizard-like, and most recently cat-like aliens, and it was important not to go there, but to choose an animal group that had rarely been portrayed as main characters outside of Disney’s Bambi. What if hoofed mammals were given the opportunity to take center stage, and be the indicative species of this world, who could take matters into their own hoofs, so to speak, and be warrior peoples? Playing it straight and seriously, what happens when you give sheep guns? 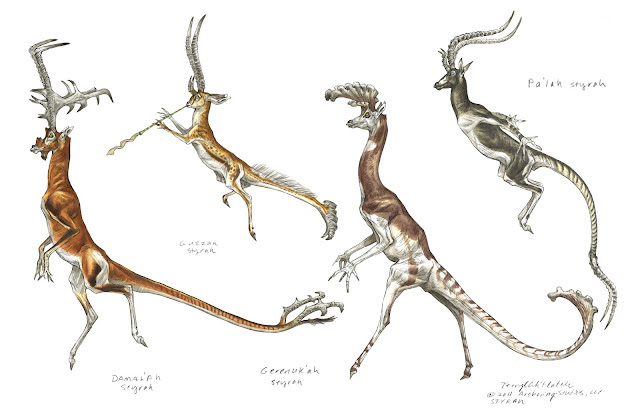 There are as many species of different Styrah as there are antelopes in Africa and Asia. Some are inspired by existing species of Earth, while others are of prehistoric origin. There are large, medium, and small species, with a bewildering, kaleidoscopic variety of horns and patterns. While all fall under the general class of Stryah (which incidentally in Latin means “Horned”, and the name Amalthea itself is derived from the goat goddess that suckled the infant Zeus, and who contributed one of her horns to become the famed Cornucopia/Horn of Plenty), these many species have their own unique subcultures, talents, skills, and roles within the greater society. Think of how upon the African plains, you have wildebeests, impala, waterbuck, gazelle, dik diks, oryx, and so many others found in the same geographical area, yet surviving in different niches within that same area. The main hero character is a Styrah, and an Ellandoran Styrah to be precise, and his kind are the largest of all the Styrah, and a proud warrior people. A strong, healthy male stands about 20 feet tall, about the height of a bull giraffe, and weighs about as much, around 2,500 pounds. From the tips of the great, spiraling corkscrew horns to the tip of the long dinosaur-esque tail, he is at least 40 feet. 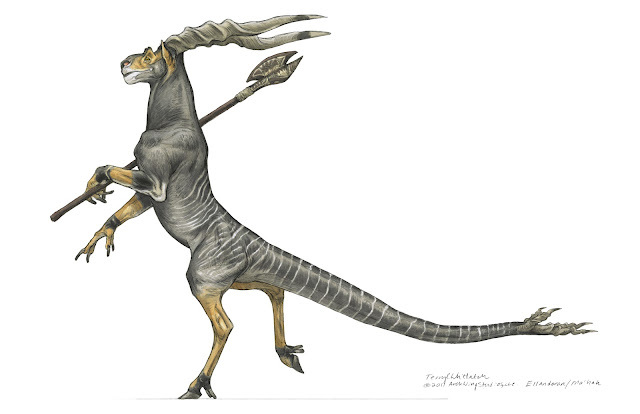 Like all styrah, he walks on his hoofed hind legs, taking great strides, and he is able to heft and wield heavy spears in his four fingered hands, which are actually exaggerated hooves. His name is Ma’hah, and his neck and head are thick, with a mallet-like silhouette, to be able to support those horns, and his muzzle is arched and aquiline, as befits his noble mien. Unlike the majority of bipedal animals, from theropod dinosaurs, birds, to monkeys, apes, and kangaroos, his spine is in an S-curve similar to ours, so that being two-legged is his primary default position at rest, leaving his arms and hands free to make and manipulate objects. The long tail provides both a counterbalance, and a lashing weapon in itself. 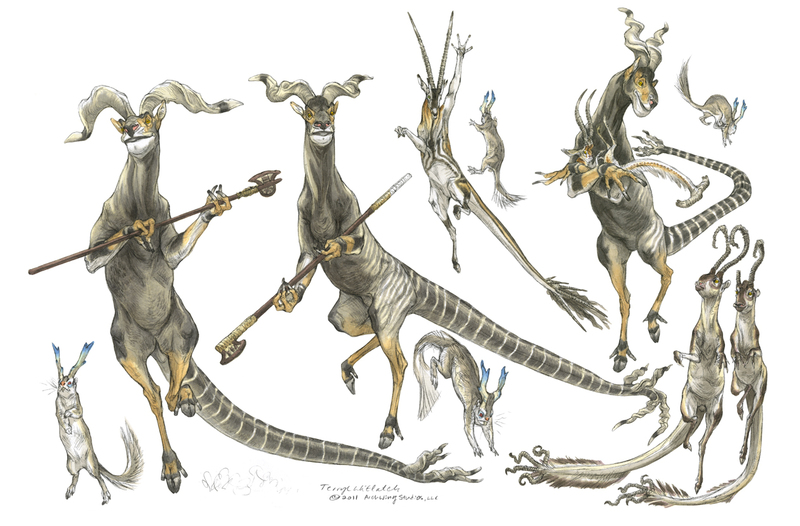 These were the adaptations I made from the basic inspirations of the Giant Eland antelope and the extinct giraffe, the Sivatherium. The Styrah have a role they must play, and this is a key principle of creature design—the story drives and pushes the anatomy, so that we can believe in the resulting characters on both our own, and on their levels. It is all about the Why of the Creature, and the basic principle of Creature Design, both for real and imaginary animals, that what an animal looks like, is exactly what it needs to do. And, if anyone would like to explore at this world, please go to www.talesofamalthea.com. I’d be delighted.